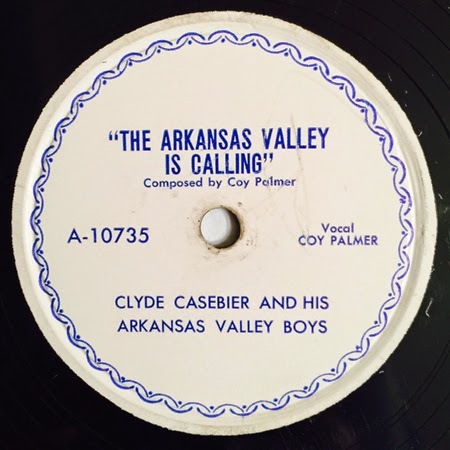 Formed sometime in the early 1940s, Clyde and his band started out in Wichita Kansas (sometimes billed as the Ark Valley Boys), before moving to Pueblo. "My grandfather heard Spade Cooley and his band play, and decided that after he was out of the U.S. Navy, that he would have his own band. He based his sound on Spade Cooley and Bob Wills," said Lori Giebel. Establishing themselves in the area, they became so popular that they opened the Arkansas Valley Barn to play their music, which was regular packed with adoring fans. A regular on KGHF in Pueblo, Clyde also had his own all-request program, where he and the band performed live, on the air. "He went on to be the leader of a band in Phoenix and had a radio show as The Money Men," Giebel said. "The band also included his oldest daughter Jeannine on violin. He continued his band throughout the years and included his other two daughters, Janet on violin, and Joyce on bass. Our home always included our jam sessions, as grandpa taught me, I was on guitar, and my little sister, Sheri on drums and bass. Later on, he taught my oldest daughter, Jennifer to play guitar."